Before our transporting experience at The Aviary later that evening, Andrew and I had dinner reservations at Blackbird, a well-seasoned restaurant in the West Loop of Chicago. Blackbird, the name of the restaurant, comes from merlot (French for "little blackbird"), French slang for the grape variety of merlot. 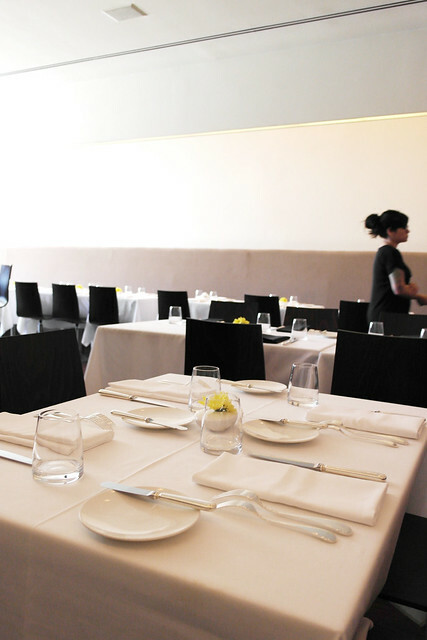 It first opened its doors in 1997 as a modern fine-dining establishment headed by Chef Paul Kahan as executive chef. The team behind Blackbird continue to "push boundaries defining modern classics using simple, local, farm-fresh ingredients and cutting edge culinary technology to create a menu both highly creative and utterly approachable. Since its opening, Chef Kahan has won two James Beard awards (Best Chef of the Midwest in 2004 and more recently Outstanding Chef in 2013). As one of Chicago's well-renowned chefs, Chef Kazan is "passionately season, unconventionally creative, and dedicated to the inspiration of classical cuisine" not only at Blackbird but at other acclaimed restaurants here like avec, The Publican, and Big Star. Growing up right here in Chicago, he was influenced by his father who had owned a delicatessen and a smokehouse, where he had helped out a lot as a young kid. After "a brief post-college stint as a computer scientist," he took his first real kitchen job at Chef Erwin Drechsler's Metropolis, where he found his true calling during his 15-year tenure there. He continued to work there and at the now-shuttered Erwin, finally moving onto Topolobampo under Chef Rick Bayless before opening Blackbird and his other restaurants. Donnie Madia, one of Blackbird's partners, and designer Thomas Schlesser "crafted a unique atmosphere of urban chic" and incoroporated "sharp minimal design elements with expanses of white space and mahogany red oak complemented by a stainless steel open kitchen." This design earned the restaurant another James Beard Award for Best Restaurant Design and Design Graphics in 2004. 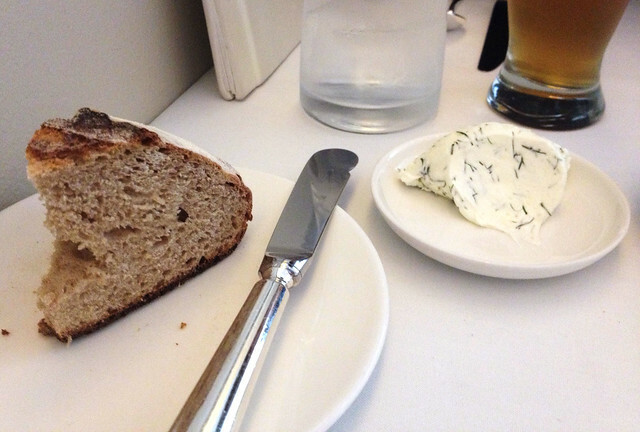 Artisan bread and dill butter. To start, I had a cocktail called the Blackbird Orange (rings like Clockwork Orange!) which had Murphy's Law riesling, Pierre Ferrand dry curacao, Imbue vermouth, orange juice, and bitters. This drink was quite orange-happy and danced lightly in sweetness with a denser composition than I've typically had, but I actually found that to work very well here. It was very nectar-like, similar to cocktails that incorporate ginger beer in them, plus I can't say that I've often had cocktails that use a wine like riesling in it. So I was very happy with this choice! Andrew had the Three Floyds "Jinx-Proof" lager from Munster, Indiana. He said he had been familiar with the brewery that makes it (pretty local). It was a solid choice for him as well because of its light body and crisp finish. 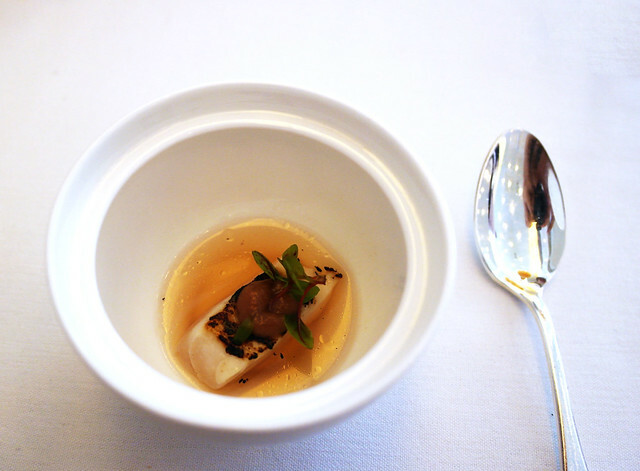 The amuse was a smoked fish (herring?) which was in a delicate, warm broth topped with a gelée of sort (I think a fruit?). Though the fine details escape me now, it was quite good. 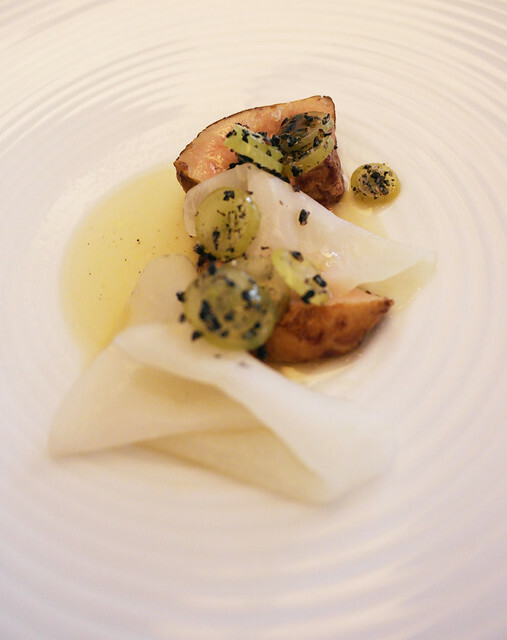 Andrew started with the roasted foie gras with kohlrabi, white grape, black sesame, and shiitake broth. A tiny disclaimer that this was Andrew's first time ever having foie gras. I am happy to report that he has been well indoctrinated to becoming a fellow lover of this French delicacy. It was warm, savory, and melty with that classic French pairing with grapes as well as a little modern twist of Asian influences with kohlrabi (great addition of texture), black sesame (some dry earthiness), and shiitake broth (additional intensity of flavor). This fusion of East and West created a really made this dish stand out from a lot of foie gras dishes I've had in the past. Very well done! 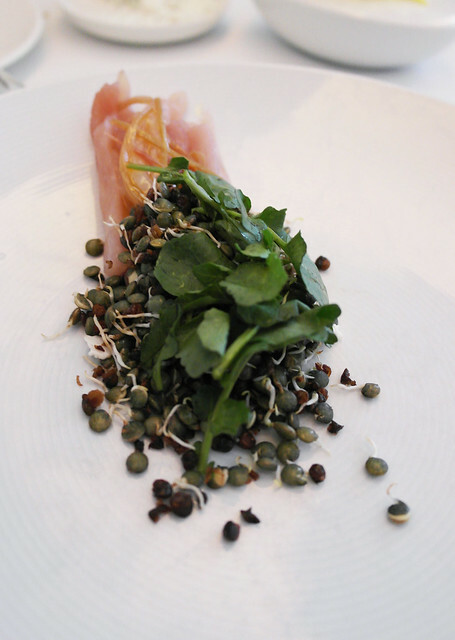 I had the hamachi tartare with sprouted lentils, cured rhubarb, spicy marrow, and chickweed. Overall, I wasn't too impressed with this dish. I expected the tartare to be a little bit more chopped up and easier to eat -- the large filet pieces made that challenging. The composition in flavor seemed confusing -- perhaps many of the ingredients were unfamiliar to me -- and didn't offer anything meaningful to note. 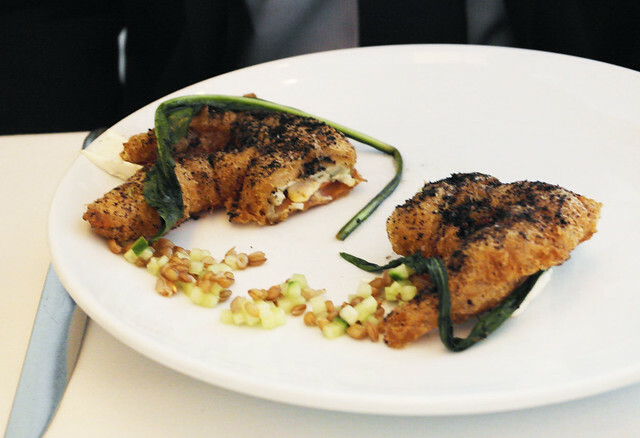 Andrew and I also opted for an additional starter course to share, one that was highly recommended by our waiter -- tempura soft shell crab with rye berries, cucumber, puntarelle, and white pepper cream cheese. With soft shell crabs being right in season, this dish proved to be an instant winner, especially as the tempura batter was just enough to coat the shells for a loose, fried crunch. The white pepper cream cheese served as an original take on the usual tartar sauce with a little spice and creaminess. It was a nice course to beckon summer our way. and granny smith apple-onion purée along with a 2009 cabernet sauvignon from Napa Valley produced by Round Pound. The striploin was nice with a medium rare center, and the horseradish caramel wasn't as biting as it had initially sounded -- it had an unusually satisfying blend to create a sweet yet light mustard. Pair this with the Round Pound cab and you're all set to go. 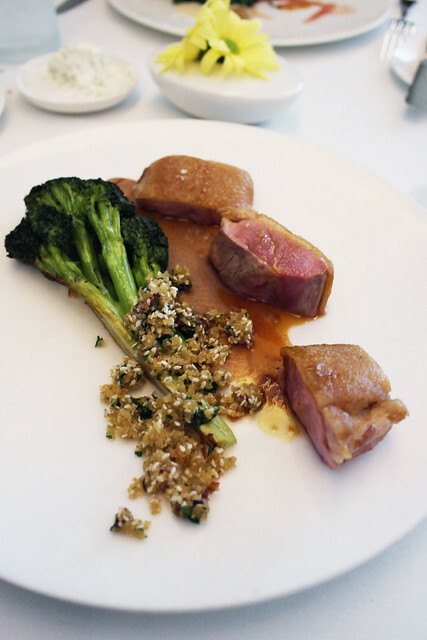 I had the aged duck breast with broccoli, potato granola, sesame, and raisin cream as my main course, along with a 2009 bourgogne (i.e., burgundy) produced by Xavier Monnot from the Monthelie region of France. The duck was incredibly succulent and tender, with its earthiness underscored by the broccoli and accompanying potato granola salad. The raisin cream added a touch of savory sweetness to the medium rare slices of thick duck breast. It was just the right portion for the main course, where I enjoyed it down to the very last bite. 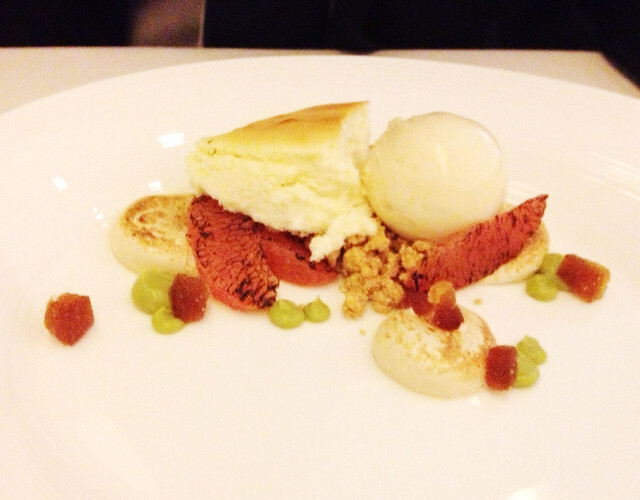 Andrew has a weakness for cheesecake desserts, so it was no surprise that he opted for the goat cheese cheesecake with cajeta ice cream, burnt grapefruit, and avocado. It is worth noting the inclusion of unconventional dessert ingredients like goat cheese and avocado and how it somehow complemented each other quite well here. As cajeta is a Mexican confection of thickened syrup usually made of sweetened caramelized milk, it seems as if Chef Kahan was creating a cheesecake inspired by Mexican ingredients like cajeta, avocado, and grapefruit (i.e., citrus) -- another instance of merging traditional and modern cuisines together. I had the bittersweet chocolate torte with burnt honey ice cream, tangerine marmalade, toasted sesame, and cumin. In essence, the flavors in this dessert very much reminded me of an orange flavored Milano cookie from Pepperidge Farm, only spiced with what you would typically find in Mediterranean/Indian cuisine (tangerine, toasted seasme, and cumin). 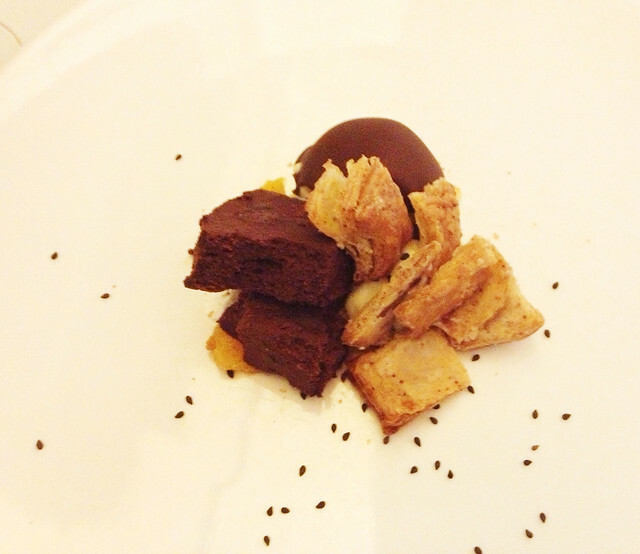 The addition of cumin made the dessert really pop, jumping from a simply bittersweet chocolate cake to something with a bit more depth, even earthy. 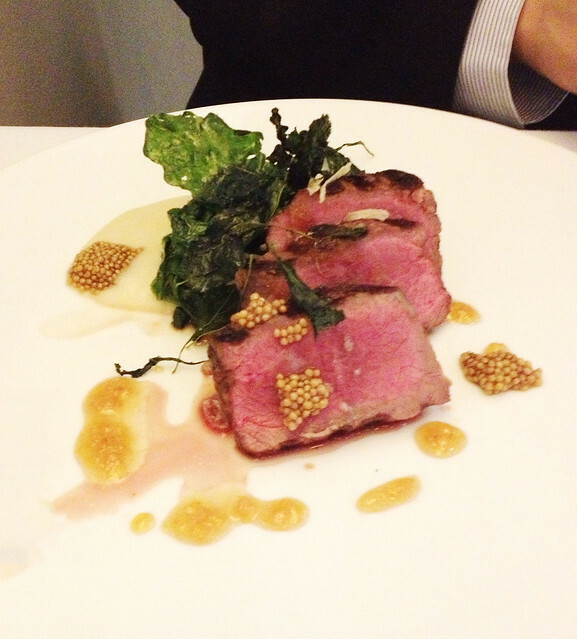 Findings: Our three-course dinner at Blackbird was very enjoyable -- a real treat of a dinner menu to dive into, for sure. I wish we had more time to commit to the chef's tasting of ten courses (but alas, The Aviary was really great, too), but Andrew and I made do with the time we had, ending up with some really memorable dishes like the roasted foie gras, the soft-shell crab, and the originally inspired desserts. As such it is no surprise that Chef Paul Kahan was awarded the James Beard Award for Outstanding Chef this year. Additionally, the service was delightful -- our server was particularly patient and helpful with guiding us through the menu, lacing it with some of his personal recommendations for which we were really grateful. 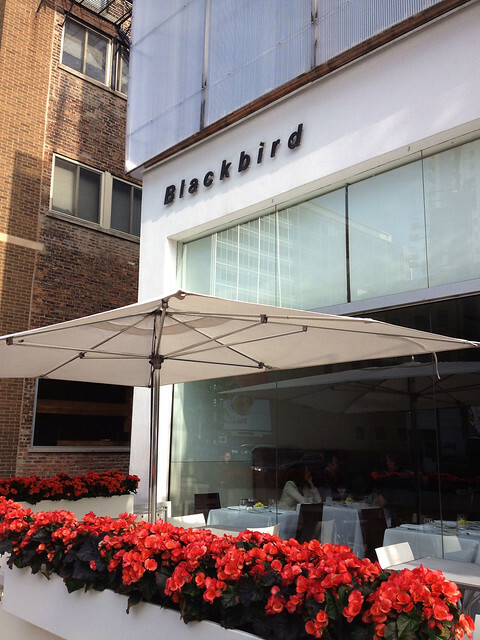 So if you're looking for a solid three-course dinner during a visit to Chi-town, Blackbird will surely be a fantastic choice with its very approachable menu with some daring twists that don't deviate too far from the average American palate. Thanks again to Andrew for joining me in this fabulous meal! 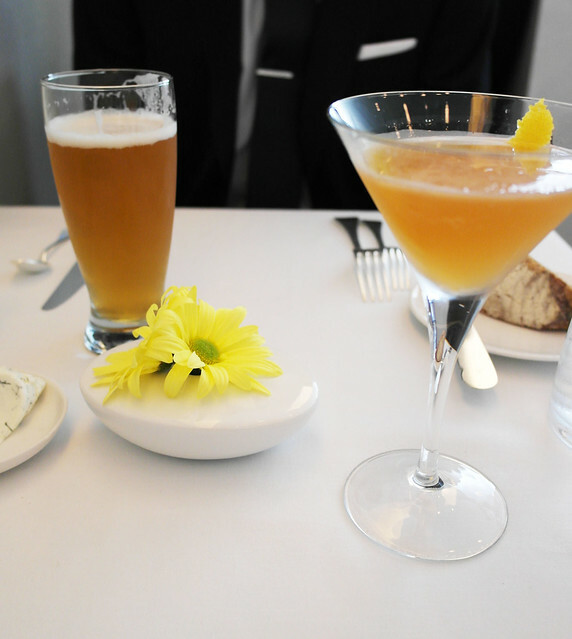 Price point: $18-22 for each appetizer, $40-42 for each entrée, $11 for each dessert, $12 for each cocktail, $8 for each beer, $15-18 for each glass of wine.